Essentially, the work flow for the DL16S is three-fold: the DL16S hardware unit, the Mackie Master Fader 5 app which resides on a tablet and communicates to the hardware via Wi-Fi, and powered speakers for mains and monitors. 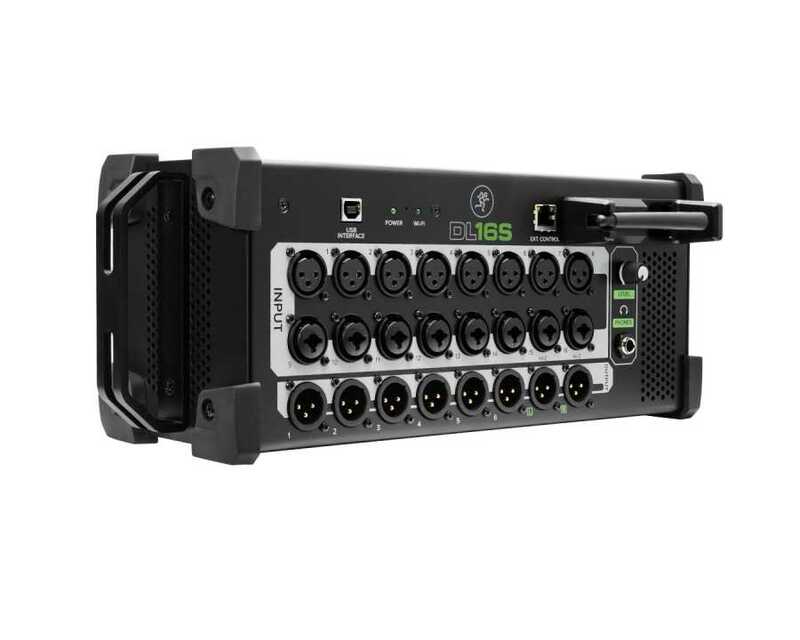 The DL16S features include 16 XLR inputs (8 XLR and 8 XLR/1/4” combo), 8 XLR aux outputs (2 mains and 6 monitor or other), headphone jack and level, Ethernet connection and USB interface. The power supply resides on the side. The actual mixer resides in Master Fader on your tablet- there are no level controls on the DL16S, unlike the predecessor DL1608, which still retained a bit of an analog feel. If you haven’t made the jump from analog to all digital it can be a frightening step but now’s the time! Mackie has always been user friendly and their digital mixer feels good and is laid out nicely and sensibly. There is a learning curve, no doubt, to working in this new digital environment but the benefits make it time well spent. I recently took the DL16S on a flight to Puerto Rico for a band gig. This unit is so small and compact that it fit in my carry-on bag, along with all my clothes, cables and other assorted items, and did not get flagged by TSA! We also managed to bring along two 10” speakers, which we fit into the overhead. For the gig, we ran three vocals, three acoustic guitars into the XLR jacks and two for drums. I love that there are actually 16 true XLR connections and not 12 plus two shared connections or a 1/8” aux device counting as a channel. We also plugged a bass guitar straight into the DL16S using a 1/4” cable with no DI. The bass was punchy and thumping after bringing the gain up to a decent level. Most of this has to do, of course, with the solid set of speakers I used. In most cases I would use a bass DI (or take a DI out from an amp) but since it was a smaller setup and on the beach this setup did the trick with no one in the audience knowing otherwise. The WiFi worked out fine and is easy to set it up. It’s best to have a clear path with no obstacles blocking the unit. You can probably go 50-60 feet before the signal drops. Using an Airport Express will improve this distance if needed. For comparison, I do also have a DL32R, the original 32-channel version in this series, which is used for larger gigs. With this I’m able to take the iPad out a couple hundred feet with no issues. But for most working bands in a club you’re probably staying close to the DL16S and will not need an external Wifi base station. Mackie is also working on a Master Fader 5.1 update scheduled for later in the year which will address many user feature requests. After your levels are adjusted, it’s a matter of saving a scene and you’re good to go. The next time we head down to Puerto Rico we just need to recall the setting and make minimal, if any, adjustments. All the levels, gains and effects are set. The only variable in saving the scenes and returning to play a venue is whether the powered speakers are at the same volume level. For a band that plays multiple venues several times a week, saving scenes cuts down the setup time dramatically. The gain structure on the DL16S is digital throughout. Analog gains on a digital board never made sense to me. If somebody bumps the analog gain knob you have to fix it. With a digital mixer you set it and save everything about the mix. 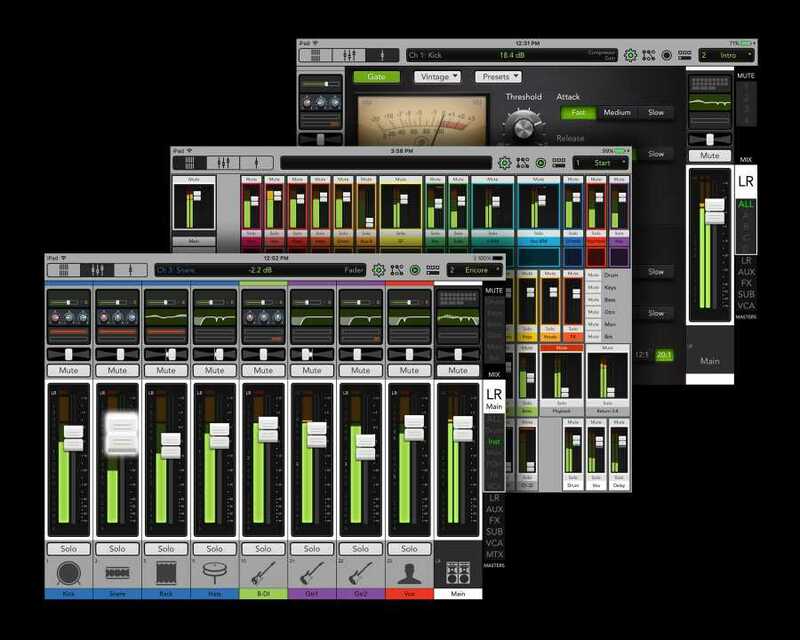 Your ultimate goal is to have the mixer at unity gain and from there work the gain levels and adjust as needed. This proves invaluable when you have several vocalists in a band who have different vocal techniques and singing levels, as we do. I generally find the average gain level for vocalists is between 27 and 30 on most gigs, with some minor tweaks from venue to venue. But one vocalist is very powerful so I pull back his gain level to 24, another needs her level pumped up to 30 and a third doesn’t hit his sweet spot until it’s at 33. From there, it’s a matter of fixing any potential feedback issues, which can be done manually or using the RTA analyzer. There are four effects sends, each with standard reverbs, delays, chorus and more. I tend to not overdo it with effects and will typically use only two at a time. There are a lot of other cool features to make your life easier, including naming the aux channels, labeling channels with names or pictures. Multiple band members can also tap into the unit and control their own settings. You can also take the USB out to a DAW on your laptop and record the gig. The form factor is impressive for what it fits into its small size and depth. With a little finesse, I’m able to fit my wireless microphone receiver behind the DL16S in my rack unit. When you’re in charge of all aspects of leading a band, from being the musician, booking gigs and running the sound system, it can become very grueling pretty quickly. The Mackie DL16S portable mixer, with its small size and large wow factor, is an excellent solution for any band looking to physically lighten their load, guarantee quality sound on a gig and put their mind at ease so they can focus on performing.